We visit Apple Park. It one-upped iPhone X (and was pretty pungent). Apple Park smells like ... manure. That's because the grounds on this 175-acre campus—call it a shrine to Steve Jobs—are still so new that the landscaping is freshly dusted with pungent fertilizer, helping some 9,000 native and drought-resistant trees and other foliage take root. While the star of Tuesday's big event here was unquestionably the new iPhone X, with its edge-to-edge screen and facial recognition features, Apple's new campus pulled up a close second. Walking along a few highly patrolled paths (this is Apple after all) from a large public area —dominated by its cafe/shop visitors center—to the Steve Jobs Theater, one is struck by a few things. First, this had to be what it felt like to enter Disneyland when it first opened, fresh with promise and featuring parking garages cleaner than most homes. After all, Jobs and Disney shared obsessive visions of quality and innovation. Second, the landscape architects have managed to pull off a David Copperfield-like feat, making a massive, 2.8-million-square-foot ring of a headquarters virtually disappear. Through the clever use of carefully crafted hillocks and berms, the HQ peeks in and out of view rather than dominating the landscape. Smiling Apple personnel firmly stopped all attempts to get a closer look at the Foster + Partners edifice, physically blocking meandering paths that led closer to this Oz-like building. But from a distance, the building looks less like a space ship and more like a layer cake for 12,000 employees. While Jobs has been gone for six years now, his spirit was present for this iPhone X unveiling. The campus itself is said to be a completed version of the co-founder's decade-old design for a place where collaboration and contemplation would be encouraged. 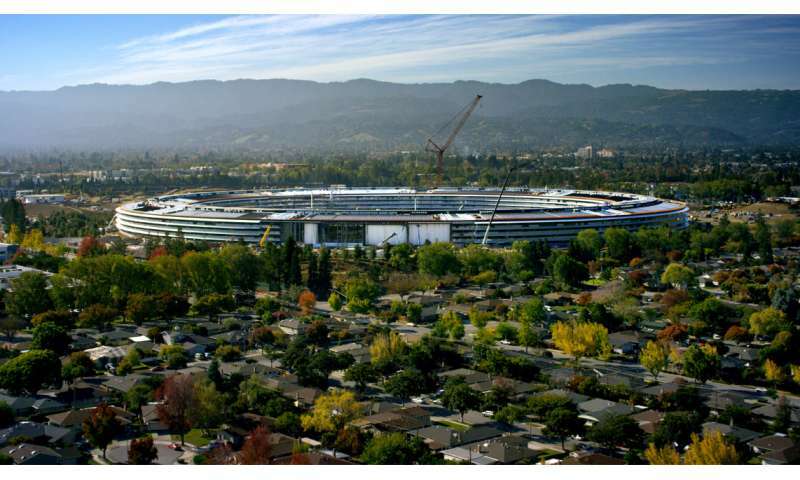 Hence the circular design (the better for employees to bump into each other) and the obsession with landscaping ("Steve was exhilarated, and inspired, by the California landscape, by its light and its expansiveness. It was his favorite setting for thought," his widow, Laurene Powell Jobs, said in a statement). The competitive iconoclast likely also got a kick out of the fact that he was building his dream HQ on the grounds of old Hewlett-Packard offices, where he once worked. Jobs' name adorns the 1,000-seat theater that sits on the highest point of the campus, from which the main headquarters looks like it's rising out of the soil. The theater is built underground, and is accessed by a circular building that is all glass and thin roof. You head below either by two broad staircases, or by taking a circular, rotating elevator that also seems to scream Steve Jobs. Why have a regular square elevator with two doors when you can build a more interesting one that is round and swivels? Inside, the auditorium has the rake of a Greek amphitheater, with modernist seats covered in brown leather with matching stitching. For now, one can only imagine with the less-public areas of Apple Park will look like, including a 100,000 square foot gym and a cafeteria big enough to feed an army. Also a mystery is what sort of landscaping will surround the more than 2 miles of running trails, as well as the precise design of an orchard, meadow and pond that will be crafted inside the main-office ring. Say what you will about the iPhone X, but despite only a brief glimpse of Apple Park, one could argue this actually is the company's greatest product yet. Google has an interesting array of buildings over in Mountain View, and Facebook hauled in architect Frank Gehry to add some spice to its Menlo Park campus. In contrast, working at Uber's building in downtown San Francisco feels a bit like going to the salt mines. But with Apple Park, the iPhone-maker has thrown down the gauntlet to the engineers of today and tomorrow. If you want to work in tech, call the other guys. If you want to live tech, call us.